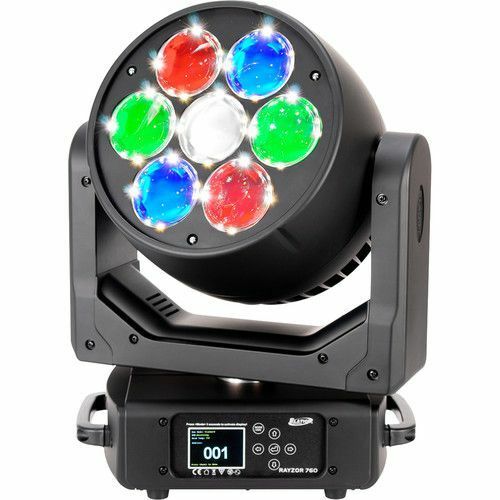 The Rayzor 760™ is a compact yet extremely powerful Wash Effects fixture featuring Elation’s unique SparkLED™ system and fast continuous Pan and Tilt motion. With its wide zoom range from 5 to 77 degrees it provides intense and well-defined mid-air beams at over 8,000 lumens as well as an exceptionally wide and even wash coverage, making it a perfect tool for any application, even in adverse outdoor conditions. SparkLEDs offer a prominent and innovative LED pixel effect with dedicated high brightness pixels inside the large front lenses for additional layers of creativity. Driven by 7, independently controlled, 60W RGBW LEDs, delivering over 8,000 lumens of output with a total power of 420W, the Rayzor 760 provides a powerful beam that stands out on any stage. The oversized front lenses create a large surface on the fixture that is enhanced by the exclusive patent pending SparkLEDs technology. SparkLEDs consists of 28 individual white LEDs, strategically placed inside the lens itself to create a unique additional layer, allowing designers access to a new and innovative way of creating interest on the stage. Rayzor 760 offers this never seen before style of internal lens illumination for depth and visual impact. SparkLEDs are controllable by the lighting console or driven by a multitude of internal FX patterns. In addition to its powerful wash and enhanced effects, the Rayzor 760 offers precise continuous pan & tilt rotation, allowing variable speed from slow to extremely fast movement effects. Combining the powerful LED output with the SparkLEDs while utilizing the 360° movement, allows the designer to create endless, unique and appealing designs from mid-air beams or wide stage washes to subtle effects for mood or the TV camera lens.